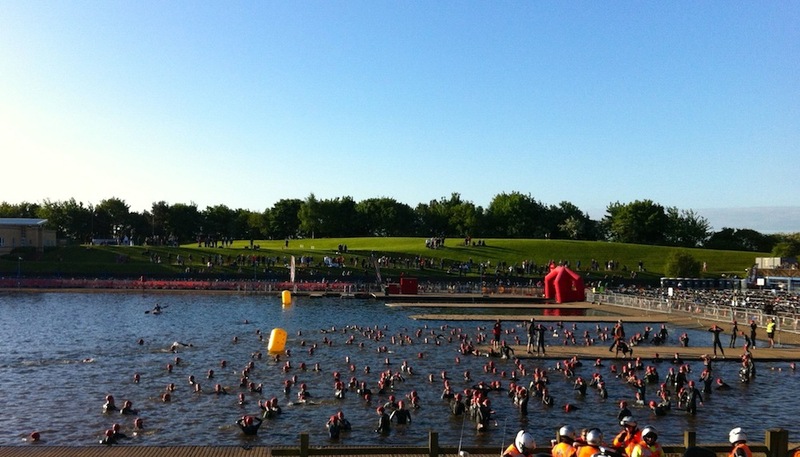 The last time I was at a triathlon was back in September spectating at Ironman Wales. This weekend I made my return – to Nottingham for the Outlaw Half. It was good to be back. My motivation to compete has largely vanished. In its wake a lack of focus leaves me training in an ad hoc fashion without real gains in fitness. I’m fine with this. In contrast Gill is highly motivated to compete, but persistent back and leg issues have left her training in an ad hoc fashion without real gains in fitness (buying a house and organising a wedding hasn’t helped us either). She is not fine with this. The half, as a relay, was a compromise that even our sporadic schedules might be sufficient for. We were wrong about that. Being insufficiently prepared to bike or run, at least without subsequent back pain, left Gill with the swim; one of my athletes, Tim, was drafted in for the bike; and being insufficiently prepared to run left me to handle the run leg – I was just going to suffer more. The runner at least has the potential for a lie in. That is unless they share a bed with the swimmer – I was up at 5am (a time usually reserved for my midweek coaching) a lie-in by most competitors’ standards, but still 6 hours before I would need to run. Gill made herself breakfast and pulled on her new wetsuit loaned to us by Blueseventy (she’d opted not to try the Helix in case she was tempted to buy); then we checked out and drove to the race venue. Our preparations were done and Tim had got into transition and racked before the crowds. There was nothing to do, but wait. Much of a relay team member’s day is spent waiting. Tim and I waited to see Gill start the swim, somewhere in a mass of black wetsuits and red swim caps. Then while Tim headed to transition ready to meet her on exit I found a spot of grass opposite his bike. 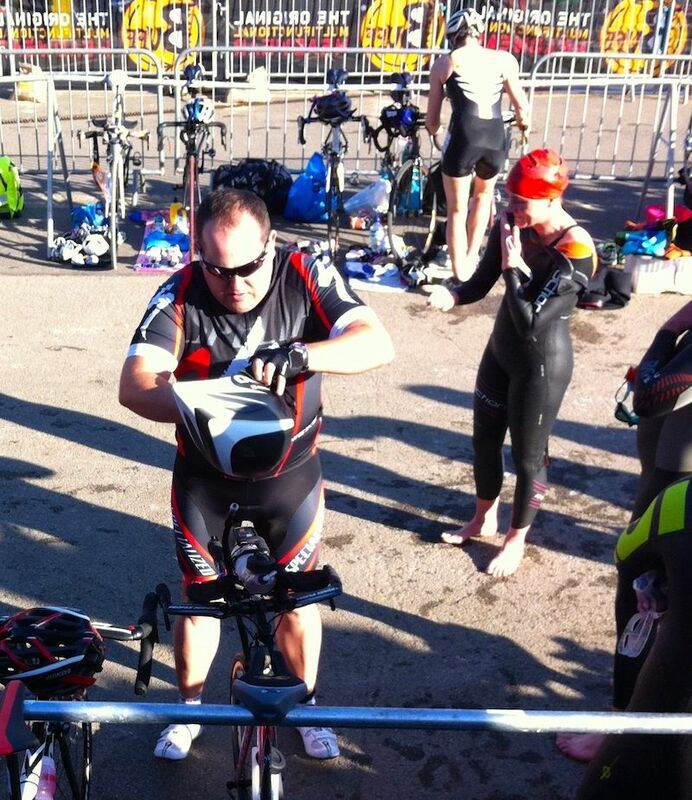 Unlike a regular race report all I can tell you about the swim is what Gill told me shortly after she finished. Firstly, and most importantly, that she exited the swim with a new PB and secondly that she swallowed so much of the rank lake that she vomited during the return leg of the swim. 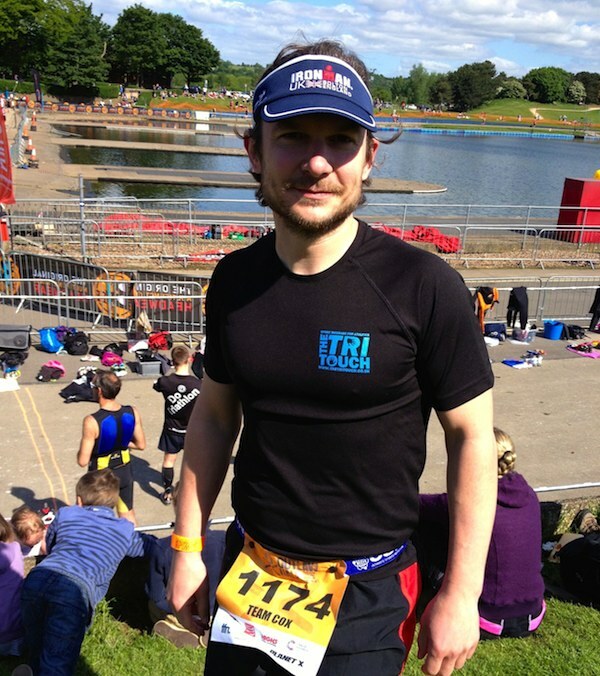 A good result – the PB rather than the vomiting. With Tim out on the bike there was little to do, but it’s hard to relax knowing you have to run a half marathon soon. Race nerves had kicked in. I feared for the second lap – my lack of preparation would show. Then there was always that chance I might miscalculate his return and leave him alone in transition. Naturally I headed down to our racking far to early so as to be safe. Again I can only offer a second-hand report of the bike. The roads are rough. Tim’s Garmin mount broke in the first mile so, with bike computer in his back pocket, he rode by feel. A check halfway revealed he’d ridden far harder than intended, but feeling strong he carried on. The result was some new power PBs and an FTP test in the schedule. Minimising the suffering was my main concern. Intentionally feel would be my only guide for the half-marathon. The first few miles felt good, the pace didn’t feel hard, but I knew that in a race I tend to push myself. I decided to stick with it and see what happened. The first lap passed pain free, but at the far end of the lake things had started to get tougher – the next lap could be a different story. This was a mental game. I broke the race into stages: past the boat house, to the aid station, through the turn point, back to the lake, to the end of the lake and then – finally – the stretch home. Each step was harder than the last, but I stayed focussed and pushed myself on. The sooner I finished the sooner I could relax. 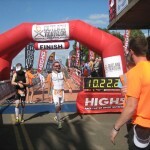 Somehow I found energy for a few bursts of speed taking a few more places before I peeled off into the finish chute. Done. I was pleased with the day. Gill’s PB of 37:57 for the swim, Tim’s performance (and power data) for a 3:10:34 bike and that somehow I could still knock out a 1:33:59 when I had trained so little. Most importantly though the day had been fun. If one team was fun, then more teams would surely be more fun. A get together and some racing for some of my athletes. Perhaps put a team together for a fast time. The run might be an exception, but swim or bike offered good training sessions – most people could do them with little or no impact on their season plans. The idea was formed: multiple CoachCox teams in next years Outlaw Half. In the meantime, to enjoy more race atmosphere, Gill and I plan to spectate at Wimbleball (weather dependent perhaps) and we’re both contemplating another 10K swim with every intention of preparing thoroughly.